Ashwood Cereal Dispenser - Cal-Mil Plastic Products Inc. 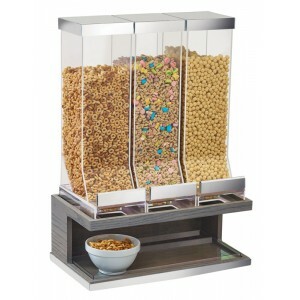 Serve different types of cereal with this 3 bin dispenser! This is perfect for your breakfast hotel bar or buffet and makes it easy for guests to dispense the cereal or dry food, such as granola, of their choice. Simply pull lever and dispense the desired amount.